Beach in Autumn Leaded Glass Panel, Surbiton, Surrey. 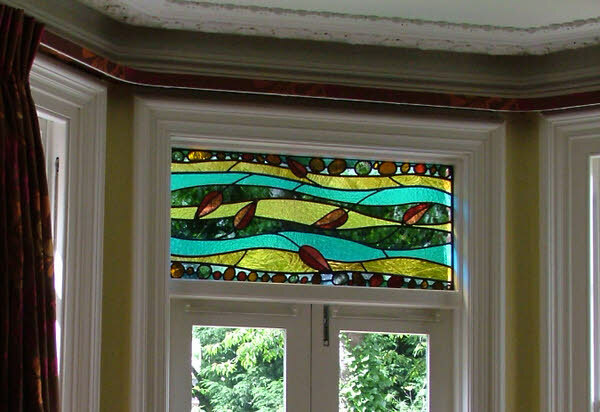 This beautiful transom panel window was inspired by the beach in autumn and falling leaves. The leaf pattern from the curtains is picked up in glass and the flowing water gives the panel a superb feeling of movement. The client and her family spend many of their holidays in Cornwall and they wanted to evoke a memory of those times. There are pebbles depicted in glass in the top and bottom which frame the picture. The panel catches the sun all day and sends some gorgeous colours into the room. This is a great example of how lead and glass can be used to full effect. This leaded window is made using a rich mixture of rolled cathedral glasses mixed with plain sheet colours, this variety of glass gives an extra dimension to the leaded light. 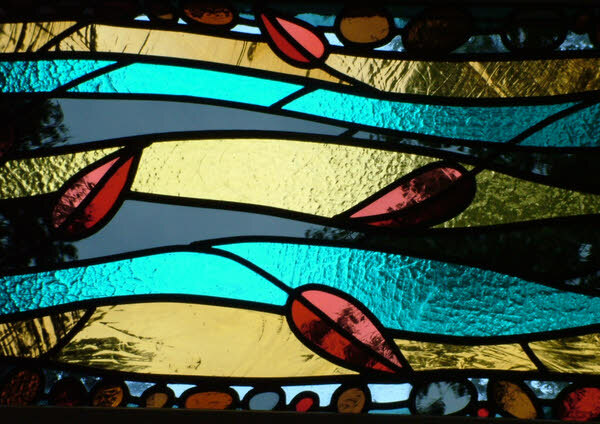 The leaves have been plated (two pieces of glass fixed together in the lead) to get just the right colour. Yes we go to these lengths to ‘get it right’! Error: Error validating access token: Session has expired on Monday, 08-Apr-19 03:56:55 PDT. The current time is Friday, 19-Apr-19 11:30:24 PDT.